The Valencian Community, comprised of its three provinces: Alicante, Castellon and Valencia, is situated in the privileged environment of the Mediterranean. Valencia has a remarkable location that makes it an unique land full of contrasts. Its 485 kilometers of coastline offer a succession of beaches, marinas and places of great natural beauty. At the same time, its interior never ceases to astonish thanks to wide variety of architectural relics, monuments, artistic sets and natural landscapes - a few of incomparable peculiarities that join to the warmth of the local people, the unbeatable food, the uninterrupted festive calendar and to a wide range of cultural and leisure activities. 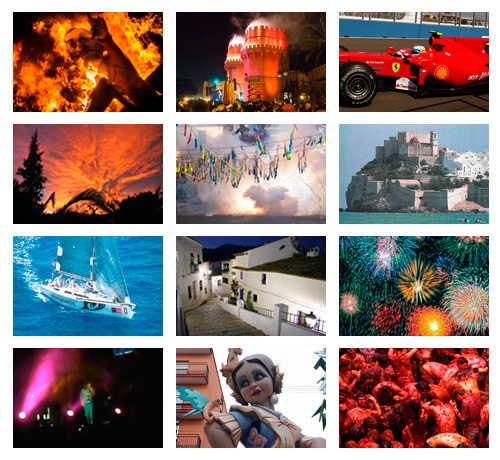 All of these special features achieve that the Valencian Community is the tourist destination of millions of people every year, as well as the pride of those who have the privilege of living here.